There are some places that sit firmly in the “I’ve died and gone to heaven” category, they are just THAT good. The natural surroundings are picture perfect, while the accommodation is the exact mix of luxury and comfort and the service is unobtrusive yet impeccable. Lucky for us, a resort that fits this description isn’t too far away. Take a look at this place and we challenge you not to be suitably impressed. 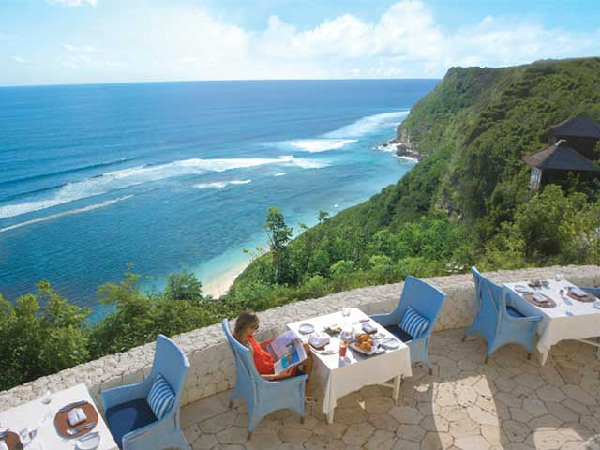 The Karma Kandara Resort is set over one of Bali’s most stunning beaches, on the cliffs of Uluwatu. And if you manage to get here for a well-deserved break, we reckon you must have earned some pretty good karma points to be rewarded in such an amazing way. 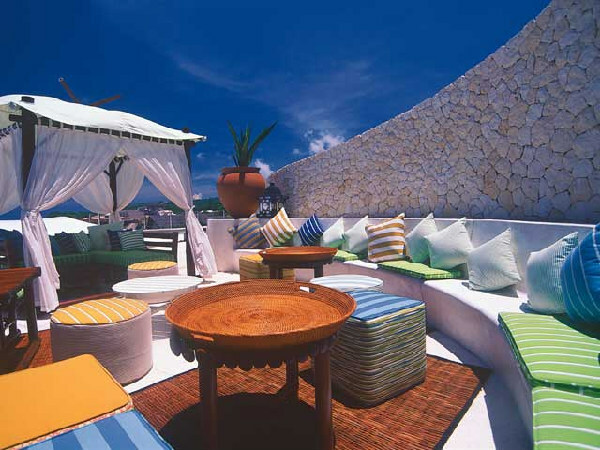 Located on Bukit Ungasan, the southernmost extremity of the island, the resort opened just two years ago and still has the sparkle of a brand new property. There are only forty-six luxury beach villas here and they overlook your own private beach and the sparkling waters of the Indian Ocean. 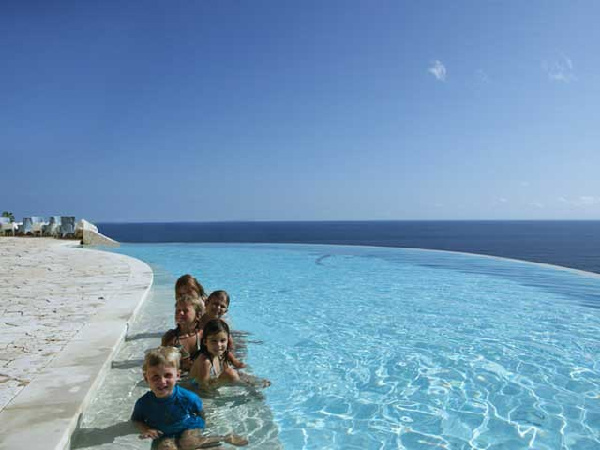 Each villa has two or three pavilions that frame an infinity pool and lush garden courtyard. There are lounge and dining areas, complete with LCD TV and surround-sound audio, as well as a fully equipped kitchen with SMEG appliances. 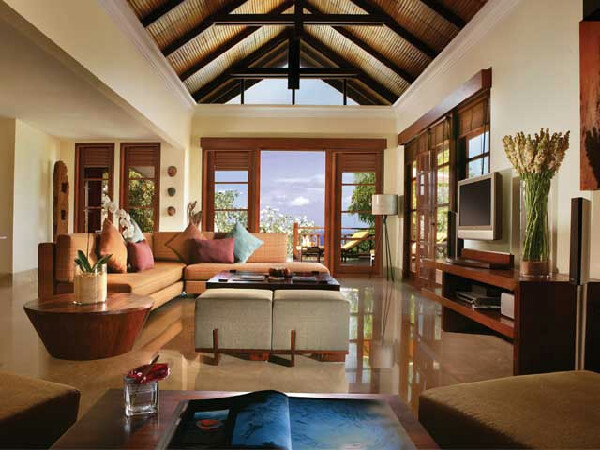 You can choose to stay in a two, three or four-bedroom villa, with each bedroom having its own ensuite. You’ll start your day by waking up to the most magnificent view that will take your breath away – as all villa bedrooms face the ocean, your first sight will be the sparkling sea just begging you to take a dip. You promise to visit a little later, then head out to your private plunge pool for a refreshing wake-up swim. Now, feeling peckish? Perhaps you’ll call on twenty-four hour room service to deliver breakfast by your pool, or if you prefer to prepare breakfast yourself, you’ll request all the ingredients to be delivered to your door. You’ll want to indulge in a private barbecue dinner with your own personal chef or waiter one night, too. If you’re enjoying your villa surroundings so much, there’s no real reason to leave! Now it’s time to explore. Take the inclinator down to the private beach – it’s not only the kids who’ll enjoy the ride! Here you can hang out at the Nammos Private Beach Club. 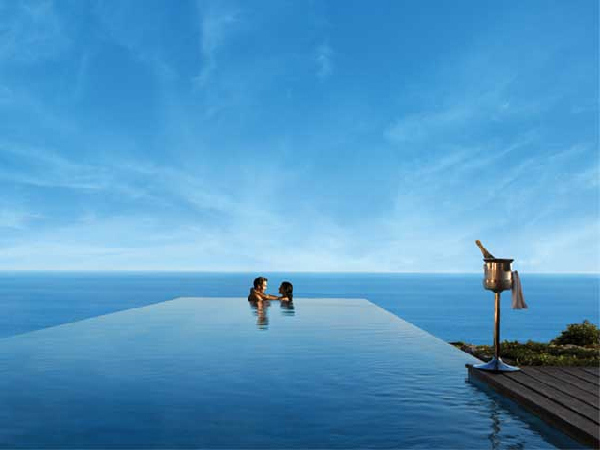 You can swim in the ocean or in the resort’s horizon pool. Relaxing in the sun on a daybed, playing with the kids or reading a good book in a private pavilion will help your morning fly by and before you know it, you’ll be ordering lunch from the beach club’s extensive menu – take your pick from Mediterranean snacks, such as gourmet pizzas, and even a signature cocktail. Why not, you’re on holiday! For something truly special, enjoy the freshest seafood lunch imaginable. Choose a lobster, prawns or other shellfish in the lagoon and your waiter will literally put on his flippers and mask and collect your feast. Or, if you prefer, you can catch it yourself. Instead of singing for your supper, you’ll be swimming for it! What a great travel story to come home with. If the kids need a little more stimulation, they can leave you at the beach and join the fun at the Karma Kids Club. The usual delights that keep kids happy are on offer here: treasure hunts, dressing up and junior cookery classes will keep them busy. By now you’re probably deciding whether to tear yourself away from your daybed. If you do, you’ll be well rewarded with some amazing snorkeling or diving nearby. A luxury catamaran will take you to dive sites and coral gardens around neighbouring islands to swim with a host of beautiful sea life. 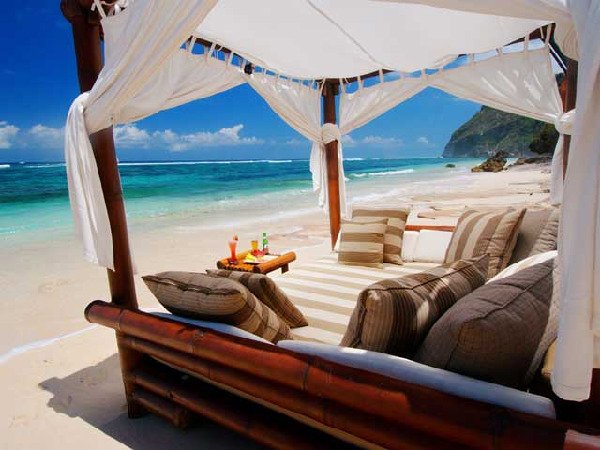 Or ride a private speedboat to one of the deserted beaches nearby for a gourmet picnic. Want to see your surroundings from a different angle? 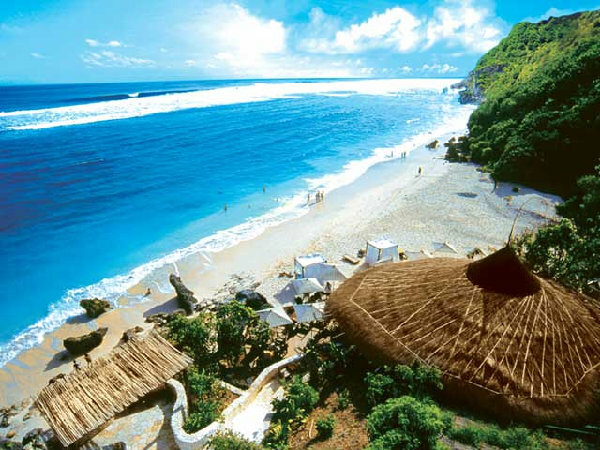 Take a helicopter flight to see the beaches, rice paddies and dramatic cliff tops from above. Now, what to do with the rest of your afternoon? 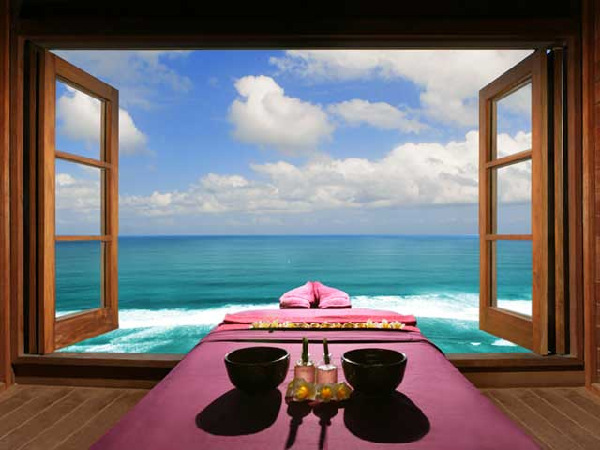 Perhaps you’ll head to the Karma Spa – with oxygen facials and Moet & Manicure getaways, you’ll not only be blown away by the expert treatments but the surroundings will have you wide-eyed as well. If you choose a signature treatment, it will take place in an all-white stone temple steam and scrub room. There’s also a Himalayan crystal salt pool to immerse in. Or you can enjoy a sunset massage on the open-air platform while making a note to yourself that sunrise yoga sessions also take place here. Finally, the sun is setting and your delicious day is coming to an end. 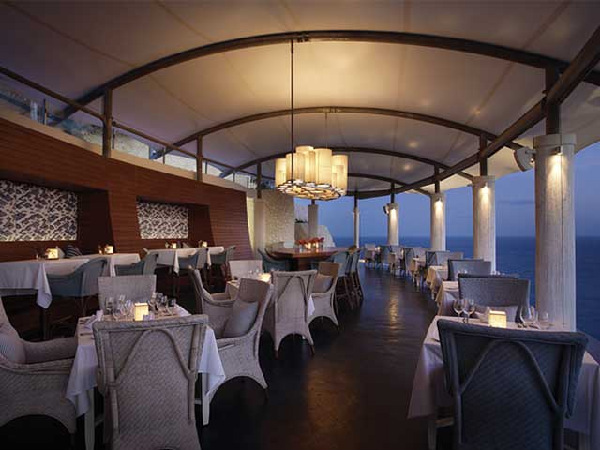 The only thing left to decide is if you’ll eat at the gourmet di Mare restaurant, with its perfect food and wine matching, or the Temple Lounge and Bar, with its North African ambience and tapas-style dishes. Wherever you have your sundowners – make sure you propose a toast to good karma!